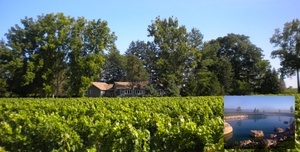 Surrounded by splendid vineyards, Vineyard Villa is located in Niagara on the Lake. A homemade breakfast is served each morning. Two Sisters and Peller Estates vineries with its fine dining restaurants located jus few minutes walking distance from Vineard Villa as well as Niagara River Parkway with its walking/bicycle pathway. Other various restaurants and theatres can be found with 4 minutes' drive. Each room here will provide you with air conditioning, an electric kettle and small fridge. All have an en suite bathroom with free toiletries and a hairdryer. In addition, Hickory Junior suite offers a kitchenette with a full size fridge, a microwave and a toaster. The Vineyard Villa is decorated with original paintings of Italian and Dutch artists and opens out on to a terrace. Bicycles can be rented within 7 minutes' walk from the property. This bed and breakfast offers free parking. Canada's new outdoor outlet mall is 15 minutes' drive from the Vineyard Villa. No children under 7 years old. ALL OUR PRICES ARE IN CANADIAN DOLLARS. Example, as of March 29, 2019 one Canadian dollar was worth 75 cents US.